Looking through some island pics I came across this photograph I took quite a few years ago on Lamai Beach Samui in Southern Thaialnd -- just goes to show people been behaving badly for a loooong time! Any thoughts for a caption? "Ahh ... oiii hate ! *$@'ing card-only machines ... hic! Whad are ye lukin' at?!! Ooooo ..."
This photo speaks volumes. Nice one, Stuart! just relaxing in the sun waiting for a phone call! Things like this still happen a lot though, even in BKK. always funny. 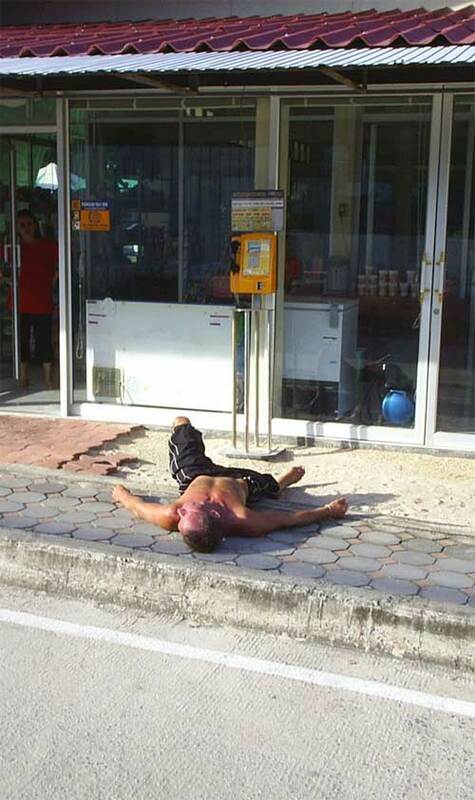 Another day, another drunken farang! I saw some terrible examples of this of this in Phnom Penh and Lovina (Bali) in particular. Probably would have seen more of it on Koh Phangan but I avoided the Full Moon Party period. "And That One Looks Like A Turtle With Wings"
"Jim thought Lamai Beach was a bit overrated but at least he had this stretch of sand all to himself"
In the words of the great Clint Eastwood: A man's got to know his limitations.